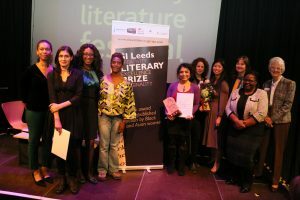 The 2016 award ceremony for the SI Leeds Literary Prize was hosted by Ilkley Literature Festival at the Ilkley Playhouse Wildman. A memorable evening, the event was hosted by Dawn Cameron of ILF and the Prize steering group, and featured poet Malika Booker in conversation with head of judges, Kadija George. Terry King, President of SI Leeds, introduced the 2016 award ceremony and thanked the Prize’s partners. She paid tribute to our invaluable core support from Ilkley Literature Festival and Peepal Tree Press, plus in-kind support from key partners Arvon, The Literary Consultancy, New Writing North and others, who have provided such a great range of prize benefits for our winners and shortlisted writers. Key Prize sponsors Aspire-igen and Arts Council England were singled out for their invaluable financial backing, which is so welcome during the current financial climate of uncertainty. Dawn Cameron welcomed Malika Booker, who gave a memorable reading of her poems about Caribbean funerals, before introducing chair of judges, Kadija George, to introduce the shortlisted writers. All six shortlisted writers then read extracts of their entries, which were wonderfully diverse, and very much demonstrated both the range and real quality of writing from the 2016 Prize. Extracts can be read here. The 2016 Prize team: from L-R: Fran Clark [shortlist], Stella Amadou [shortlist], Harkiran Dhindsa [shortlist], Kadija George [head judge], Amita Murray [1st prize], Jamilah Ahmed [3rd prize and SI Readers’ Choice award winner], Winnie M Li [2nd prize], ​Caroline Harrison [Aspire-igen, sponsor], Susan Yearwood [judge], Margaret Oldroyd [judge]. Margaret Emsley, President of SIGBI (Soroptimist International of Great Britain and Ireland) spoke about why Soroptimists support the Prize, and introduced the SI Readers’ Choice award, representing the favourite shortlisted entry as chosen by some 20 Soroptimist members from across Yorkshire. The prize, two years’ free subscription to Mslexia magazine, was awarded to Jamilah Ahmed Recognising Strangers. Please enjoy our gallery of images from the event – all images © Max Farrar.